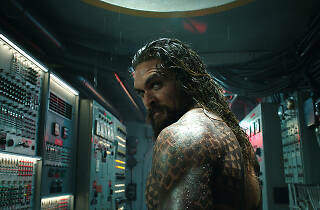 Jason Momoa's surf-bro superhero is a welcome addition to a ponderous genre, but his movie as a whole is waterlogged. If you’ve ever wanted to watch a five-course seafood dinner have an epic battle before your eyes (as infantile and wonderful as that sounds), Aquaman’s final 20 minutes will be your new favorite thing. Gargantuan lobsters and crabs—hailing from the “Kingdom of Brine,” of course—rumble against weaponized sharks and an armada of creatures that swim by in a blur of bubbles. Howling above the din with his trident and golden armor is mega-tattooed Arthur (Jason Momoa, wearing this superhero stuff extremely lightly, and all the more charming for it), or, as he’ll come to be known, Aquaman. 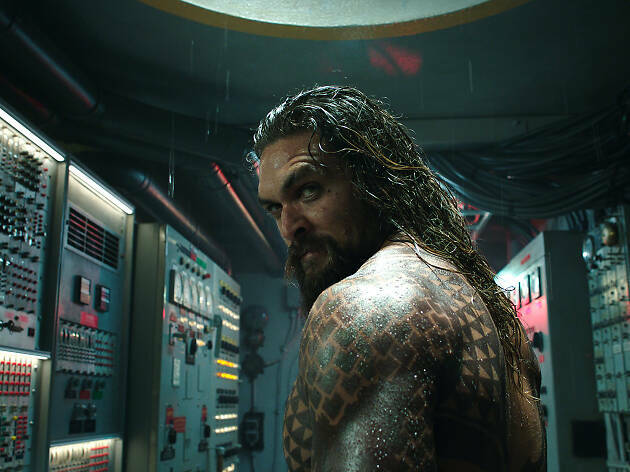 As helmed by director James Wan, who has grown from 2004’s rough-and-ready Saw into a playful steward of big-budget ridiculousness (Furious 7), Aquaman seems inspired by some of the more psychedelic panels devoted to DC Comics’s water-breathing warrior—pages filled to the brim with gob-smacked fascination with the world below, in all its colorful diversity. But getting to that delirious showdown feels like holding your breath for two hours. Certain audience members will care deeply about who becomes “Ocean Master,” the ruler from among the warring factions of the mythical city of Atlantis and elsewhere, just as there must be those who wonder about who will win Game of Thrones. But all the exposition is deadening, even with brave actors like Nicole Kidman and Willem Dafoe delivering it. “The king has risen,” Dafoe intones, answering the film’s least suspenseful question (and possibly remembering when he starred in stuff like The Last Temptation of Christ). Instead of trying to surf every wave, it’s better to let this one flow over you, like composer Rupert Gregson-Williams’s bloopy score, a lovable throwback to the 1970s work of synth wizard Jean-Michel Jarre. Some fleeting moments are inspired: a dark, plunging escape from the Creatures of the Trench, illuminated by a single red flare; a striding emergence from the sea scored to a dance cover of Toto’s “Africa”; a Sicily-set sequence in which Arthur and his redheaded squeeze Mera (Amber Heard, committed to the crazy) come off like honeymooners—until they start destroying priceless statuary like a pair of ugly Atlantean tourists. Aquaman is more seawater than bongwater, unfortunately, but when it gets trippy, it floats within hailing distance of Doctor Strange. It's a superhero movie, fits the mold of what we come to expect.